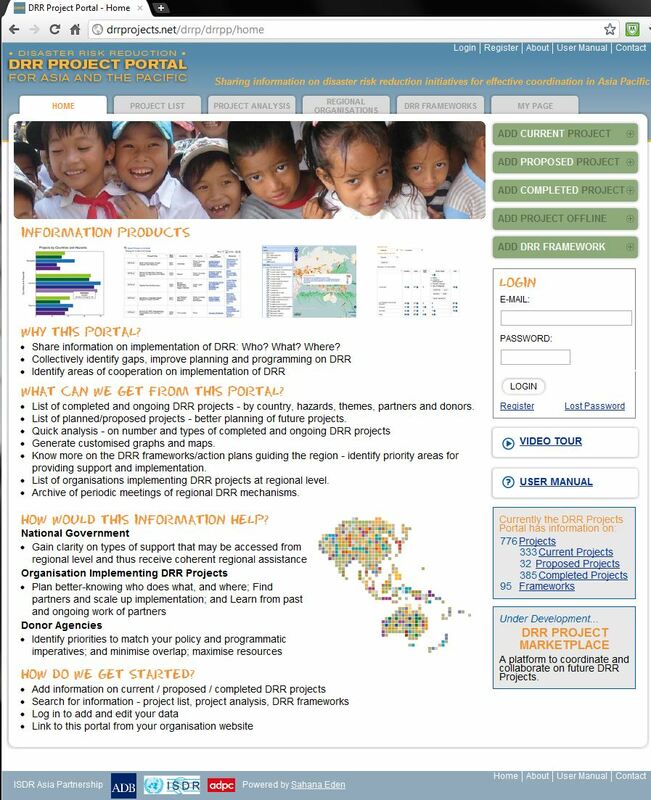 The DRR Project Portal is a system for sharing information on all Disaster Risk Reduction (DRR) initiatives in Asia and the Pacific for effective coordination in the region. By showing who is doing what where it aims to increase collaboration and cooperation on DRR programming between governments, donors and organizations in Asia and the Pacific. The DRR Project Portal is an initiative of the UNISDR Asia Partnership on Disaster Reduction (IAP) with funding support from the Asian Development Bank (ADP) and executed by the Asian Disaster Preparedness Center (ADPC). The Portal was developed using the Sahana Eden open source disaster management platform. The Portal, first developed for sharing information on regional and multi-country DRR projects, is now being expanded to allow for the sharing of national and sub-national DRR projects as well. ‘My Page’ where logged in users can save searches, graphs and maps, and subscribe to email updates. Since its launch in October 2010, over 4,500 users have visited the DRR Project Portal from over 140 countries. There are now over 750 current, completed and proposed DRR projects saved in the database, and 90 frameworks, strategies and roadmaps.